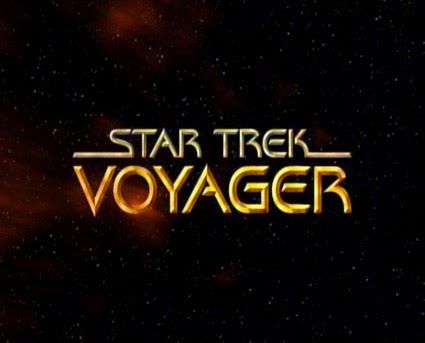 The Doctor wakes up on Voyager and the ship is EMPTY! It's a MYSTERY! Cut to the opening sequence. So after I watched the cold open for this one, I went in the kitchen to make an ice cream cone (because obviously) and told Scott that I'd got to an episode where I couldn't remember what was going on. I was SO excited. And I kept waiting for the moment to roll around when I would eventually go, "Oh yeah. This one." But I sat there, my ice cream long gone, going, "Is it Seska?" "Is it...Vidiians?" No. "It's too early for Species 8675309... right?" And then Barclay showed up and I totally lost it. I finally just bought in to the fact that I couldn't remember what was going on. I know I watched it. I know I watched it recently. I remembered everything that happened as it happened. But the whole supposedly sinister, probably complicated element behind the Doctor's experience completely eluded me. In the end, the solution isn't actually complicated or sinister. And maybe that's why I forgot all about it the resolution. This episode isn't really about opposition or conflict. It's about the Doctor's character and about the way he's already grown so much. He's no longer a limited-use hologram without any ambition beyond fixing up whoever it is that's having an emergency. He's a person with hopes, dreams, fears and, as it turns out, love and the beginnings of a family. His experiences (in this aptly named episode) are projections of all these things and they show someone who has already exceeded the limitations of his programming. It's a powerful episode for that reason. Its power is in its simplicity and its reliance on character development rather than a thrilling, rug-pull ending. -This is also the one wherein we get a kind of lampshade for why Paris looks so familiar. 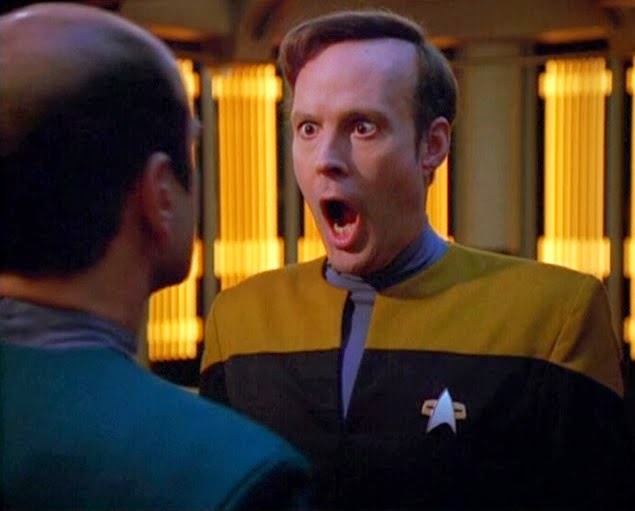 Supposedly it's because he's modeled on Barclay's cousin Frank but actually because Robert Duncan McNeil played Nick (the Nova Squadron leader who made Wesley tell dirty, dirty lies) in TNG's "The First Duty." -Barclay! 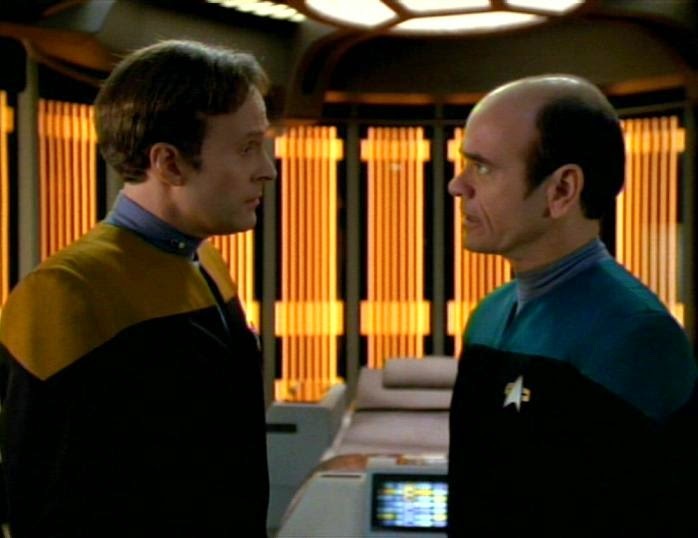 Anytime Reginald Barclay shows up it's a good day. Johnny! I laughed out loud when I read this comment and I totally understand where you're coming from. I thought maybe I did give it too much credit and was just in an overly-generous mood because of how excited/distracted I was by not remembering the (not very) big ending. But, really, I think my feelings about this episode are rooted in how much I love the doctor as a character. Knowing what he'll become, where he'll go, his future hijinks etc surely fuels my enjoyment of this one. Threshold, though, I cannot wait for Threshold.